“The Hearth of Marie of the Incarnation”. Stone, brick, mortar. 17th century. This underground room was previously located outside of the building. Inside was a stone fireplace, called a hearth, used for cooking. The Ursuline’s hearth was quite large: in fact, it was big enough to roast a whole cow! 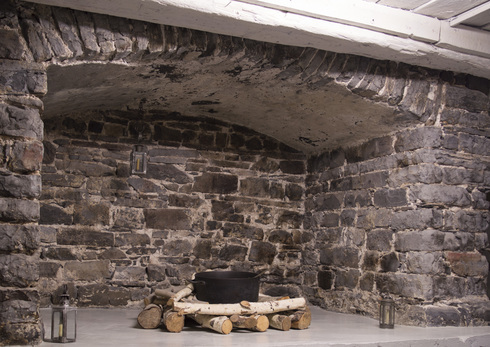 The hearth could accommodate an enormous kettle in which the sisters would cook “sagamité”, a Native American dish. Marie of the Incarnation adopted the recipe for the stew made from corn and meat, and later added her own special touches. She often served meals to the natives and to the French who lived near the Monastery.